We know that being injured on the job can be frustrating and financially stressful. The process of filing the workers' compensation injury report, undergoing an independent medical examination and fighting for your needed compensation can be extremely complex and confusing. In order to answer the most common questions, we have created this FAQ page to provide you with general information about workers' compensation claims. We make every effort to provide accurate and current resources, but because each individual state and personal circumstance is unique. You must not rely on this general information as factual for your specific situation. There is no substitute for the advice of an experienced attorney or advocate. For a no-cost/no-obligation review of your case, please complete this simple form by clicking here. 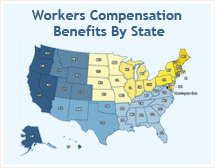 A workers' compensation attorney will quickly contact you for a free evaluation of your claim. Note: Please check back with us soon, our Frequently Asked Questions are currently being developed and will be added to the website shortly. Thank you for your patience while we improve our site.